Satisfaction through new insights ! Again we closed an exciting training on Results-Based Management or Project Cycle Management applying the Logical Framework Analysis tool in design projects and programmes, appraise the quality of proposals and in Monitoring & Evaluation. And here we like to post the feedback and evaluative comments by participants and have a reflection and discuss what they thought of it. I absolutely and utterly enjoyed the PCM course you took us through, and it is difficult to put words on all I learnt during those five days. I came to the course with the idea that it would be a very dry and technical set of tools to learn around Project Management and how to set up more relevant, feasible and sustainable projects. But I came out of the week with a much wider and encompassing understanding of Project Management and the process one goes through when assessing, setting up and creating projects. It was a real discovery that I will take with me for life because it wasn’t only about a set of tools and the understanding of a process. It’s about a mindset when it comes to development work and how to go about it; it’s about getting a REAL understanding of the system in which a project is meant to be implemented in, it’s about a way of interacting, approaching and understanding our environment and the people around us; it’s about really LISTENING. I discovered in the PCM process and the LFA tool a way of empowering people, a framework in which critical questions can be asked in a good way, and where we can learn about an environment and context. It was wonderful to see how one can create a space in which people feel comfortable to share with the group thoughts and worries and ways in which one can systematically get to the bottom of what the real problem is. I cannot tell you how delighted I am to have been able to follow this course with you! For me the course is not only an additional paper added to my CV, which will help me further my career in my current field – even if this may be the case. It has been the discovery of what I want to do professionally. I have finally recognized myself in a profession which combines all the values and aspects I profoundly believe in and which I consider key to respectful and broader understanding of the people and environments we leave with and in. I can completely understand you. For me was the same after my 5days course. Here in Italy it’s not easy to speak about PCM yet and this is for me very exciting…as a challenge! I just finished the LFA and workshopping course in Brussels. Of-course I was very inspired to exercise a little bit further with my newly learnt skills and capabilities. A friend of mine was very sad about her struggle how to fit her capabilities as trainer, coach and teacher in empowerment of drop out pupils in a new organization with less experienced staff and management. I proposed her to put her struggle on paper as a starting document for an LF analysis. Together we made an objective tree, followed by an LF “what” and LF “how” matrix. She was happy to get step by step insight in her own possibilities for intervention and I was happy to have such an interesting exercise case. My question to the other group members is: What are your experiences with LFA and workshopping in a private situation? Are there advantages/disadvantages for the moderator compared to a professional environment? My feedback starts with the fact that I thought I needed more PCM knowledge/structure but actually I needed precisely what this course covered – centered on the LFA. I was slightly disappointed that performance communication management wasn’t given much space, though I understand you have to go with the group and there are only so many waking hours in the day! The course blew away so many cobwebs for me and it was a joy to hear such enthusiasm about the log frame where as usually comments are negative and a lot of people think it should be dropped – now I realize its because it has not been taught properly in the first place (if at all). I’m most definitely a promoter now. I have already used the cards yellow and green because they force you to be succinct and pertinent (and because I love all the interaction that comes with cards). And, in answer to Herman (Hi Herman!) I can see a lot of similarities with other tools doing the rounds for self development. Though LFA seems to be more structured and clear (when its explained properly). I haven’t used it in a private sense but we practiced such a lot that many of the principles are quite embedded for me now and I hope it will come fairly naturally to use it in any situation. Developing my nascent company is about to get the treatment! I’m not really sure what you mean by your last question but if you mean is it very different I would probably guess a “no”. It was extremely interesting that Erik frequently backed away from content and just stuck to the process. It was a great week for me, what I didn’t learn new, I gained consolidation, but mostly I gained insight. And I very much enjoyed working in our ‘team’. I felt very at home and I know hard work went on behind the scenes to enable that – it was appreciated. 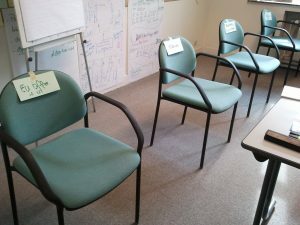 Today I got my next experience with facilitation of an 18 participants workshop. My initial plan was to fill out an LFA “how” matrix with the group. We planned to use the mission statement as “project purpose” to redefine the more than 54 ideas to “results” and to define actions needed to achieve these results. During the workshop this turns out to be a bit too ambitious. Nevertheless my colleague facilitator and me manage to get a well defined mission statement from the group and large number of ideas, well clustered over 5 topics. Actions have not been defined due to a lack of time. Although the results were acceptable for the group in the available time (2,5 hr), I still have the feeling that more useful and structured information could have been achieved when the matrix had been completed. Is there anybody who knows how this could have been achieved and how much time should have been reserved to get the “how” matrix completed in the given circumstances? Herman, I have done two “shooting excercises” (or formulation workshops) which might also be useful in this situation. A good preparation is the key. 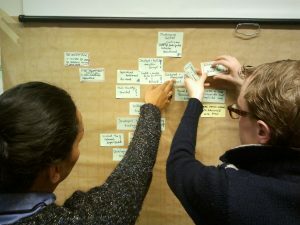 You can prepare a HOW matrix with a small group before the actual session: At the session the participants can “shoot” at this and give their opinions. The session takes at least 4 hours and the result is a good project plan (if you have the right participants). You probably need some more time to get a mission statement. Thanks Tom for your useful comments. I think indeed it make sense to prepare the How matrix with a small group prior to a shooting session with a large group. 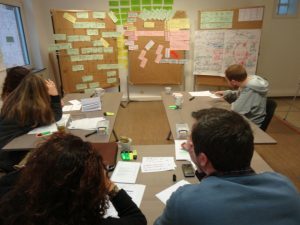 I would like to offer some feedback on the PCM/LFA combi course I attended in Brussels. In my opinion it was a very welcome and thorough introduction to the PCM/LFA system, illustrating the advantages and benefits of using this kind of framework, which can otherwise come across as slightly off-putting and daunting to the uninitiated or those with an instinctive aversion to charts and matrices… The practical exercises and applications we ran through constituted my main reason for signing on for the course, and it was great to get some real-life examples from an experienced “facilitator” who had actually been involved in such a wide variety of real-life projects. You can get the theory from any book or brochure, but I think you definitely need some practice and critical feedback to develop real confidence in applying it and to realize the advantages it offers. The system really gives you a versatile framework for the structured, critical and logical analysis of projects… for one, it definitely showed me how easily dodgy assumptions and elements erroneously taken for granted can slip in under the veneer of sweet-sounding professional jargon. The PCM/LFA system at least forces you to take all the aspects involved in implementing a project into consideration and to discern potential pitfalls before it’s too late. 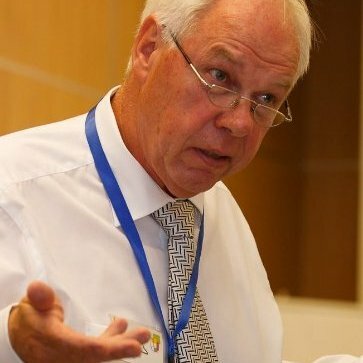 After 15 years in Cooperative Training in Zambia and in the Tropical Dairy sector in Indonesia and Tanzania, Erik realised the serious problems with PLANNING of PROJECTS and thus specialised in the facilitated participatory multi-stakeholder Logical Framework Analysis and Planning (LFA) methodology.